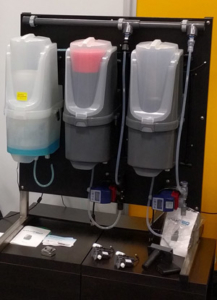 Solid water treatment products by Precision Chemical use state of the art, proven chemical combinations which are manufactured into a solid paste concentrate. The products are transported in a low carbon footprint profile and applied easily at your site with a patented dissolving system. You receive all of the benefits of a well-run chemical program, without the hassles of dealing with liquids. 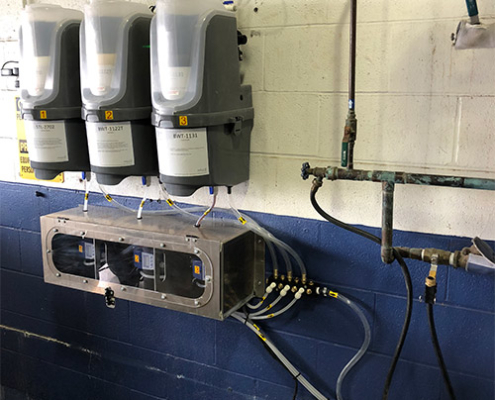 Precision Chemical’s solid water treatment products help your facility to be more Sustainable and Safe – while addressing your TRIPLE BOTTOM LINE. Reduces potential for injury to employees and others. Moving heavy drums can result in injury, leading to costly Worker Compensation Claims. Reduces risk of exposure to hazardous chemicals (ie: corrosives, oxidizers and pesticides) to your employees and customers. One case of solid chemistry weighs 44 lbs and contains the same amount of active chemicals as a 55-gallon, 500 lb drum. Spills can occur anywhere – in transit, or at your facility. Many liquid chemicals can be hazardous, damaging to the environment, and a potential for expensive litigation. Solid chemistry has no potential to leak. 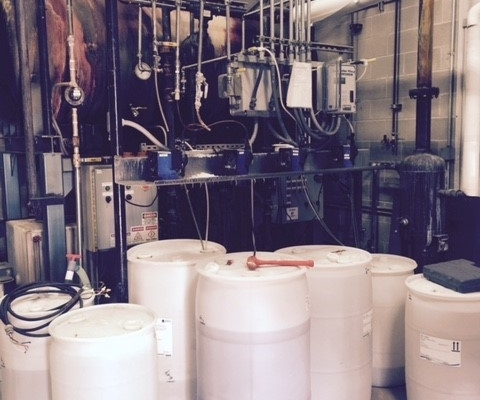 Liquid chemicals are bulky and must be stored in containment areas according to their hazardous classification. 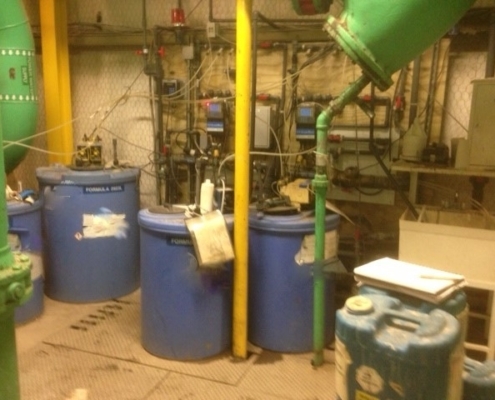 Many facilities do not have extra space and must resort to storing all chemicals in one containment area. The potential for chemical reactions of different liquid chemicals can produce a very undesirable result. No triple rinsing of empty drums before disposal. Five cases of Precision Chemical solid chemistry can sit in the same storage footprint as a 55-gallon drum. The cost of transporting solids is approximately 1-2% of the chemical costs, versus 15-20% of the chemical costs for liquids. Approximately 15-20% of your chemical budget is used to ship mostly water when using liquids. Solid chemistry can help you save water, sewer, and chemical dollars by reusing the water, its maximum number of times. One case study concluded that increasing the number of times water can be reused in a cooling tower from 4 to 6 cycles, would have the effect of reducing water make-up demand by over 408,000,000 gallons annually in just the Commercial and Institutional markets. Liquid chemicals are very heavy and consume a great deal of energy to transport. Most liquid products require adding caustic to the mixture to remain in solution. 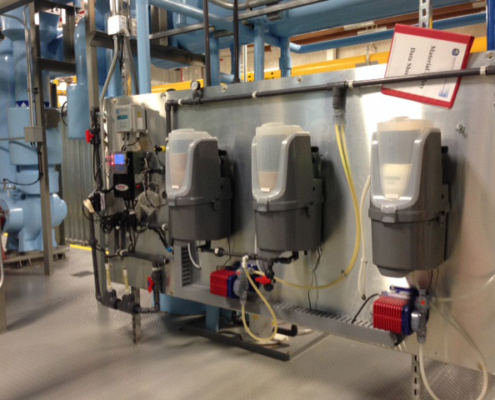 Solid concentrate products do not require the addition of hazardous caustic. A 55 Gallon drum, weighing 500 pounds, will consume 2.5 more gallons of diesel fuel per typical shipment than a 50 pound carton of Precision Chemical solid chemistry having the same amount of active ingredients.